I want to upgrade my 5dm3 for the 5DM4 really for faster tehtered shooting from usb 2.0 to usb 3.0. Then i noticed it had a wireless feature. Does anyone know how this camera performs wirelessly tethered to a MBP to lightroom? I don't own the Canon 5D Mark IV yet, but it's the next camera purchase. I also do not tether, but I have researched the topic and feel pretty confidant of the following comments. Wireless tethering of the Canon 5D Mark IV is possible, but most folks recommend only sending the JPG files of a RAW+JPG capture. JPG files take around 2 seconds while RAW files take around 15-20 seconds. The JPG files are sufficient to check focus and lighting elements, but you still need the RAW files for maximum image control. 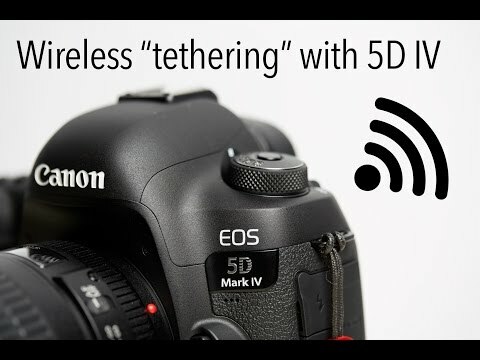 Canon 5D Mark IV Wireless "tethering"
USB 3 wired tethering is really much faster, albeit with a cord which can get caught, tangled, damaged, etc. (Just be careful with the cable.) Most folks simply describe USB 3 tethering as "instantaneous", or they don't describe it at all (meaning it's not a problem). BTW, if you use Lightroom make sure you turn off the FTP transfer stuff on the camera as that generally interferes with USB transfers. icing on the cake would be quickish jpg transfer but I can live with a cable. Oh yeah...eos utility ...a few demos on youtube nearly instantaneous. Faster than using light-room wirelessly on camera wifi. Only consideration now is buy the 5DM4 at $400 off, $3100, no tax, free shipping from b&h ( offer expires 9/15 midnite) or buy one from refurb from Canon at $2700. Plus tax $150. Glad to see a serious tethered photographer making good use of the technology! I have a 5D Mark IV and I use wireless tethering fairly often for portrait shoots. I use the Canon Camera Connect app on an Android tablet. On the plus side, this app is pretty speedy, takes about 2 seconds to view new pictures. And that's regardless of whether you're shooting raw or JPG. This is because the app doesn't transfer the full images from the camera; it only transfers JPG previews. Essentially it's showing you what's on the camera. It does cache the previews so you can flip through them quickly and get a thumbnail view. Pretty handy. On the downside, it's a bit clunky. You would hope that new pictures would pop up in full-size on the tablet, but it doesn't work that way. You have to return to the thumbnail view to pick up the new photos. Still it's better than being connected by a wire. I hadn't tried the Lightroom folder-monitoring trick yet using the EOS utility to transfer photos, so I tried it just now and was unable to transfer photos. I don't know whether the fact that a 30+ year IT guy can't make this work is a statement about the usability of Canon software or my own ineptness. But I'll just say I haven't had these problems with the Sony remote control software which works fine for me.